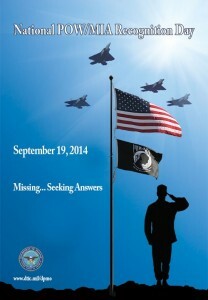 For the past several years, DPMO has produced a special poster for National POW/MIA Recognition Day. These posters are poignant reminders of our continued respect for those service members who paid the ultimate price on behalf of our country and that the mission to bring home their remains will never end. The 2014 poster is one of my favorites. National POW/MIA Recognition Day is observed annually on the third Friday of September in honor of the brave men and women of the armed services, who are still missing from past wars — namely, WWII, the Korean War, Vietnam War and the Cold War. Each are officially listed as POW/MIA, and this special day is one in which the US Government renews its commitment to do everything possible to bring them home to their families and to the country for which they made the ultimate sacrifice. The 2014 event falls on the 19th this year and is traditionally observed at government installations, including the Capitol and White House, along with multiple locations where active duty military, veterans, families and other patriotic Americans gather to remember these special heroes. Many families with loved ones still missing would give anything to turn back the clock and be given just one do-over. But we all know that do-overs are trendy ways of saying second chances, and our plight is not a game but rather a dream that the remains of our husbands, fathers, sons and brothers will be found one day, and allow us to close the circle. As the Department of Defense prepares to debut a new agency that will try to speed up global recovery efforts of our MIAs, I wish them success and hope all MIA families and veterans will help make it work. There will be opportunities for many of us to become partners in this very complex effort. With the threat of terrorism looming large and the drawdown of military troops leaving us with fewer service members than post-WWII, please make National POW/MIA Recognition Day more than an annual observance — let’s pledge to help the DoD get the job done. 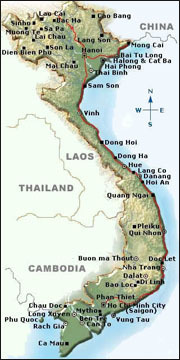 This entry was posted on Thursday, September 18th, 2014 at 2:22 pm	and is filed under Vietnam MIA. You can follow any responses to this entry through the RSS 2.0 feed. You can leave a response, or trackback from your own site.